Tuesday's game did not go well at all for the Mets. The Nats have just set a team record for runs in a game, with 24 tonight against the Mets. That tops last year, when they scored 23…against the Mets. The Nationals sent 12 batters up in the first inning, collecting eight hits. One of those came from third baseman Ryan Zimmerman, which was his 1,695th with the team, setting a Nationals/Expos franchise record. Washington starting pitcher Tanner Roark hit a three-run, bases-loaded triple in the first to drive Mets’ starter Steven Matz from the game. 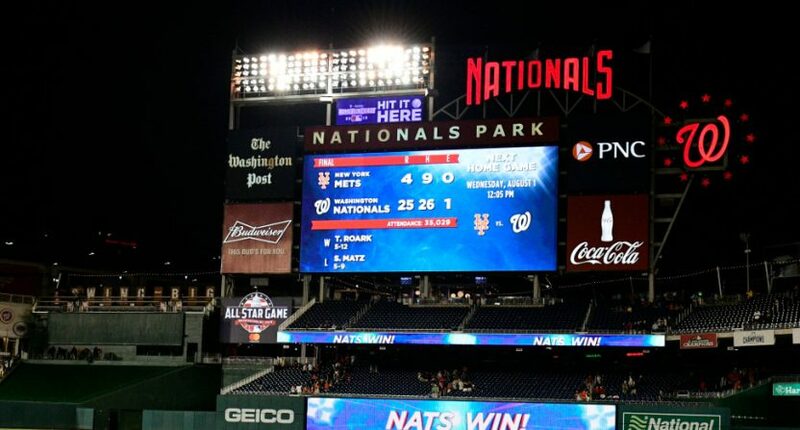 The Nationals’ 19-0 lead through five marked just the second time in history a team has held an opponent scoreless through five innings . All nine members of the Nationals’ starting lineup recorded at least one hit. Yeah, that’s not so great. And there are plenty of issues for the Mets to fix. But Tuesday’s showing was yet another low in what’s been a season full of them.